across activities and concepts, Common Core coverage, and more. reports as a spreadsheet and import them into your gradebook. With Quill Premium, teachers can access Quill Progress Reports, which allow teachers to easily view and download their data. Quill Progress Reports show teachers how students are progressing on the Common Core and which concepts they need help with. 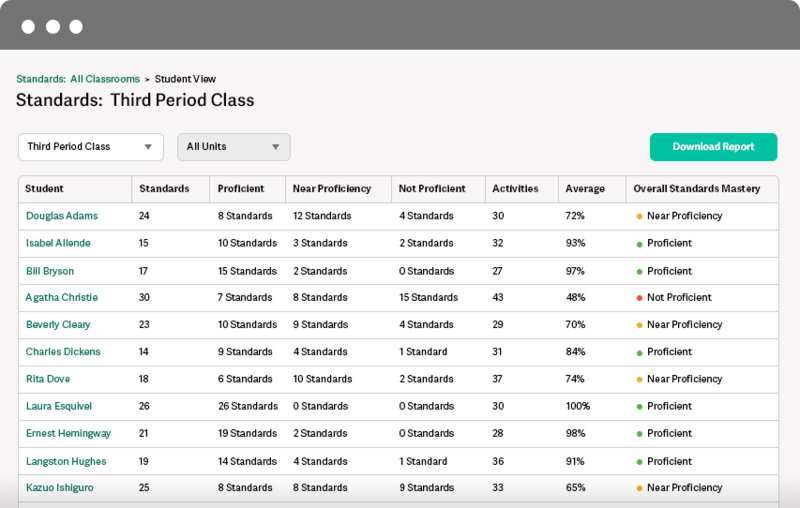 With Quill Premium for Schools, teachers and administrators can access a school-wide dashboard that shows student progress and standards mastered across the entire school. How does payment work on a Premium Membership? Quill Premium is provided on an annual license based on the school year. You may pay via credit card or check. Credit cards will be billed annually for Teacher and School Premium. If you pay with a check, Quill will issue an invoice to renew your subscription. Quill Premium is provided as a teacher license, school license, or district license. The teacher license covers all of the students for one teacher and costs $80 per year. The school license is a site-wide license that covers all teachers and students in the school, and costs $1,800 per year, with a 50% discount for the first year. For districts, we provide custom pricing, on-site training, and district dashboards. Contact us to receive a demo. Yes, we accept purchase orders. You may email a purchase order to sales@quill.org. You can access our W-9 by clicking this link and you can reach out with questions at 646-442-1095. Yes, we provide Quill Premium for free to schools that have a demonstrated financial need. This funding is provided to select partners thanks to the support of our funders. Please contact us to apply. You can call us at 646-442-1095 or visit our Support Center.